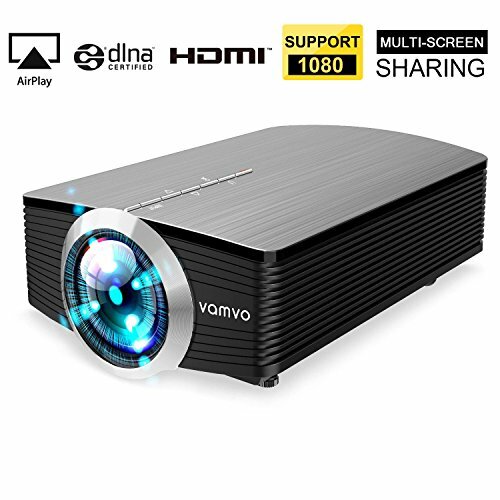 Vamvo YG510 HD projector which can connect your smartphones/tablets with USB cable and other common devices by the USB/AV/SD/HDMI/VGA interfaces is ideal for large screen home entertainment. √ CLEAR IMAGE -- Vamvo YG510 1080P projector, adopted the lasted upgraded LED technology, provides 20% brighter image than ordinary LED projector. √ PORTABLE -- The size of Vamvo mini projector YG510 is almost same iPad mini so it is easy to take to enjoy movies, musics or play games anytime and anywhere. √ DURABLE--Vamvo Upgraded LED Projector adopts the latest technology Smarteco Lampcare to make the rate of energy conservation up to 70% and lengthen the life span to 30,000 hours which is 10 times of the traditional ones. √ RAPID HEAT DISSIPATION -- The heat vents are integrated with the speaker mesh on the both sides of the projector body which makes the heat dissipate rapidly. ①Just as cinema, the dark the environment is, the better the performance is. ②It is not recommended to use for PPT or business presentation. Duplicate your Smartphone Screen via USB charging/data cable: Instantly turn your tiny phone screen into a large, high resolution projection. You can totally get rid of the visual fatigue from staring at a small screen for hours. The Ultimate Viewing Experience: The Vamvo Home Theater YG510 projector supports 1080P, a contrast of 1000:1, and has a built-in stereo speaker. The result is a brilliant, vibrant image with remarkable sound effects. Absolutely fantastic for watching a family movie or for playing your favorite video games. *Non-encrypted videos from YouTube, Amazon Prime Videos, NFL APP,mobile browsers, and streaming sent via the HDMI port are supported by default. Encrypted Videos from APPs such as Netflix APP and Hulu APP may require additional HDMI cables/adapters/sticks, such as a ROKU Dongle, Fire Stick.